Notice how succulent rosettes contrast beautifully with Cathy Leiss’ auburn hair? She’s a little shy (ha). Here’s how to make a succulent-decorated hat and more, with design ideas from attendees at succulent events. I’m wearing a butterfly hair ornament made by Laura Eubanks for a photo shoot. She used tiny sedum rosettes and string-of-pearls. 1. Assemble your materials: a hot-glue gun, a hat or other wearable, dry moss (from any craft store), and succulent cuttings. 2. Glue moss to the area you’ll cover with cuttings. Like a moss-filled succulent wreath, this gives the cuttings something to root into. 3. Hot-glue cuttings to the moss. Wondering why they don’t cook? So do I! You can’t touch hot glue without getting burned, but—go figure—cuttings are fine. 4. Cuttings eventually send roots right through the glue into the moss, so treat the hat as you would a topiary or wreath: Store in bright shade and spritz occasionally. 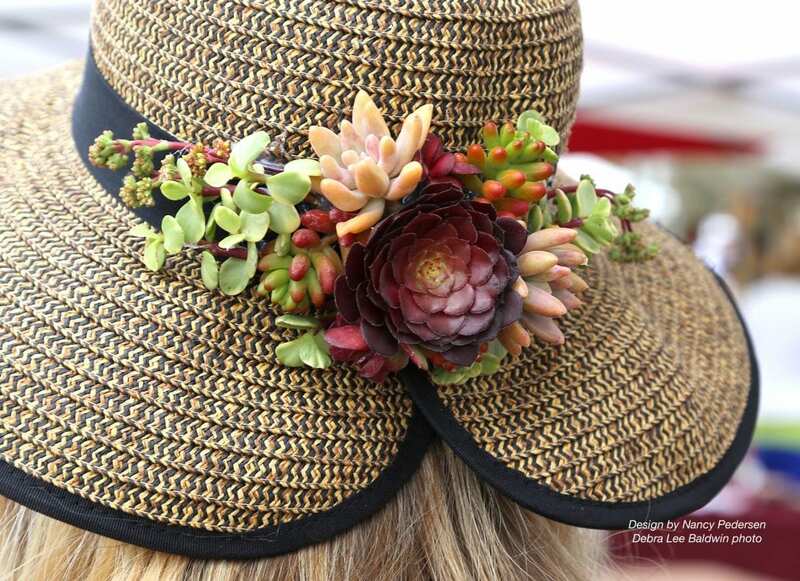 Laura Balaoro of San Jose, CA, founder of the Succulent Fanatics Facebook group, is known for her succulent chapeaux. In fact, she and I collaborated on an article for a national magazine showing how she does it. Above: Yellow-orange Sedum angelina contrasts with purple echeverias and Sedum ‘Blue Spruce’. Suggesting a ribbon is the trailing succulent: variegated rosary vine (Ceropegia woodii ‘Variegata’). Laura decorates hats to match her colorful outfits. Above: Laura used bell-shaped cotyledon blooms to add a bright complementary color to another turquoise hat. Laura’s sea-themed hat includes a tillandsia, shells and even some sand. Nice earrings, too. For friend Jeanne Eige’s ball cap, Laura used Sedum angelina to repeat embroidered poppy leaves. Above: I added Aeonum ‘Kiwi’ rosettes to the center of a hat’s bow, echoed the orange in the rosettes with a flower from a dwarf aloe that happened to be in bloom (to go with my jacket), and added string-of-pearls as a cascader. No glue or moss—pins hold everything in place. Los Angeles landscape designer Shirley Kost-Haskell can be counted on to decorate a hat or visor with succulents, and earrings too. Find blank earrings suitable for moss-and-gluing at craft stores and online. Above: Design by Deana Rae McMillion for Lydia Dunaway, who came to the Succulent Celebration from Florida. Deana Rae McMillion added dried flowers and fresh succulent blooms for bright bits of color. Candy Suter of Roseville near Sacramento does lovely hat-band bouquets. At one event, a fellow attendee asked if she could buy Candy’s hat. Surprised and flattered, she sold it to her. Carrie Goode from Arizona placed Graptopetalum paraguayense on her hat. This is one succulent that the leaves pop off the stems easily, so working with them takes a delicate touch. Susan Morse of Vista, CA creates lavish hats. This one features a purple-pink echeveria (E. ‘Perle von Nurnberg’) and ice plant flowers. The flowers close in dim light—which was probably the case when Susan glued them to her hat. Smart of her to know they’d open in full sun! And here’s Susan wearing a succulent-decorated headband. Succulents stay fresh without water because they draw on moisture in their leaves. The downside is this makes them heavy, but Jen Golden of Brisbane, CA, is smiling regardless. Notice her succulent pendant, too. Blank pendants suitable for moss-and-gluing are available at craft stores and online. Designer Katie Christensen glued tiny succulent rosettes, flowers and shells to a hair clip. You probably don’t want to take the time and trouble to make a succulent lei, but I just had to show you this one, a memorable gift from the Honolulu Garden Club. Guess what? String-of-pearls makes a miserable necklace. Its little spherical leaves each have a tiny point that’ll irritate your skin. After doing this selfie, I was happy to take it off. The downside to using fresh floral material—even succulents—is that they don’t last forever. If you get a couple of weeks out of them, you’re doing good. It’s not that succulent cuttings wither and die, but rather that they get leggy. New growth elongates the rosette, and lower leaves dry and fall off. Cuttings can be salvaged (even reused), but you’ll need to pull them off the decorated object and start over. So why not use faux succulents instead? Plastic string-of-pearls are available online for around $10. For this year’s Succulent Celebration, I fashioned succulents out of oven-bake modeling clay and hot-glued them to my visor. No moss needed, and they’ll last the life of the hat. See the video: DIY Sculpey Succulent: Striped Agave (3:15). I glued faux succulent rosettes to a headband and added them to succulent crowns for book-table guests to wear for selfies. Below is Hannah Eubanks, Laura E’s daughter. Both will be at Succulent Extravaganza 2018, where Laura is presenting. (She’s wonderfully knowledgeable and entertaining. Watch for an interview in an upcoming newsletter.) If you’re a fan, delight Laura by wearing one of her Hot Mess ball caps or visors—with or without succulents attached. I’ve yet to see a succulent buckle, nose ring, belt, or bunny ears. Maybe you’ll be the first? Send me photos!